There are millions of homeless animals across the United States and not enough homes to help care for them. Join us as we cover the topic of pet overpopulation with The Anti-Cruelty’s Community Program Specialist, Tara Laffey and see how you can help prevent this problem. What are the factors that cause pet overpopulation? A big contributor is irresponsible breeding. Unspayed and unneutered pets, if left to their own devices, will continue to breed and become an overwhelming issue for the people caring for them. This results with animals ending up in a shelter. How many animals are received by The Anti-Cruelty Society due to this problem? The Anti-Cruelty Society takes in over 5,000 animals per year, but there are about 6.5 million animals entering shelters across the United States. This number has been reduced from about 7.2 million in 2011. The number of homeless animals has definitely decreased, but it’s still an issue. How many of those animals do you adopt out per year? The Anti-Cruelty Society is an open admission shelter, so we take in all animals. We are currently adopting out about 90% of our animals. What are some solutions to combat pet overpopulation? Creating spay and neuter initiatives is the number one way we can help pet overpopulation. There are just not enough homes for the amount of animals in the shelters. We need people to help spread the word that pet overpopulation is a problem that shelters can’t remedy alone, they need public support. There are plenty of animals waiting for homes in shelters across the country. If you are looking for a specific breed, it is likely you can find that breed at your local shelter or breed rescue. While spaying and neutering won’t completely solve the problem of pet overpopulation, let’s talk more about this option. What are some benefits of being spayed or neutered for your pet? 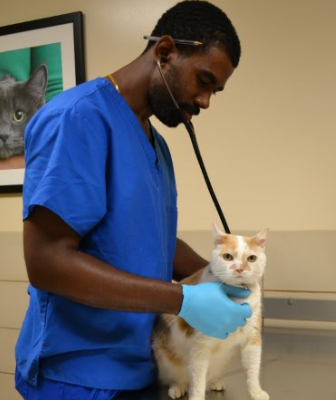 Spaying or neutering your pet can provide behavioral and health benefits. It has been shown that unaltered male dogs are more likely to bite. When male animals are neutered, they will exhibit less roaming behavior. Some health benefits to spay/neuter also include decreased risk of some cancers. Besides behavior and health benefits, spay/neuter mostly helps prevent unwanted pets and litters. Is there a recommended age for pets to be spayed/neutered? The Anti-Cruelty Society receives a high volume of animals at the shelter, and unaltered animals cannot be adopted out. If an animal comes in who is one month of age, it is not ideal to have them in a cage since they need to be socialized, so they will be sent out to foster. Once the animal is two months old and their weight is up, we will spay/neuter them at that time. This is referred to as Early Age Neutering, a practice endorsed by The American Veterinary Medical Association. Other veterinarians might recommend waiting a little more time- approximately 6 months to a year to spay/neuter. Where can owners take their pets to get spayed/neutered? The Anti-Cruelty Society offers a low-cost spay/neuter clinic which is open to the public. Approximately, 13,000 animals are spayed/neutered every year. The Anti-Cruelty Society also offers a low-income clinic. So if someone falls on hard times, that program will definitely help them out with veterinary care. We also work with groups that facilitate Trap-Neuter-Return for community cats. Community cats live outdoors and are not socialized, so they cannot be adopted out into homes. This can lead to constant breeding, which is a public safety hazard. Some people choose to be feral “colony” caretakers to help ensure the safety of the stray cats in their neighborhood. Responsibilities of colony caretakers include trapping the cats, bringing them to a shelter like The Anti-Cruelty Society for spay/neuter, vaccinations, and microchip. To distinguish the community cats that have been vaccinated and sterilized, they will get eartipped. This will allow colony caretakers to manage these colonies of cats without them becoming overwhelming and allowing the cats to live their lives outside. While we can promote spaying/neutering pets, what are some other ways we can educate people on pet overpopulation? We need to promote adoption from a shelter, instead of going to a breeder or a puppy store. Educating people that adopting animals from a shelter and giving them a second chance is really the only option if we want to help the pet overpopulation problem. Thank you to Tara Laffey at The Anti-Cruelty Society for her insight into pet overpopulation. We appreciate the hard work of the staff and volunteers at The Anti-Cruelty Society in helping homeless pets find forever homes! The Anti-Cruelty Society is located at 157 W. Grand Ave and has been on the forefront of animal welfare and humane education ever since it was founded in 1899. To learn more about The Anti-Cruelty Society check out their website! Windy City Paws is a Chicago dog walker and petsitter committed to providing helpful information to Chicago dog owners through this blog.